Cactus Flower Florists: FALL's HERE... sort of? Yeah, yeah, we know. . . the temps are 105 to 110 this week, how can it be fall? Where are the sweaters, the corduroys, the aroma of burning wood from fireplaces? Don't worry, it's coming. After months and months of triple digit temperatures and triple digit SRP bills, how can we be so sure? Because. . .when we opened our flower shipment this week we found cat tails. . . millet. . . marigolds. . .sunflowers, Safari sunset protea. . .roses in colors such as cinnamon, honey gold, orange!! So, yes, fall is here. Sort of. Many of our designers welcome this time of year and the floral bounties it brings. After all, Christmas is all about the red, white and green. Valentine's Day is red, white and pink. Easter is pastels, and summer choices are a bright but can be a little limited when it's 115 outside. So fall flowers and colors are welcomed with open arms. . .the colors, the textures, the unusual things we see this time of year. So watch the temperatures (and your electric bill!) drop, little by little. 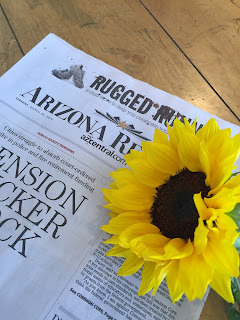 September, October, November. . .what a great time to be an Arizonan, especially if you're one who also loves flowers! On Trend: Join our Flower Crown Class! Annual Rose Sale Ends August 31st!